These plastic Army man costumes started because we found the Keystone Light – White Beer Can. We wanted to do something crazy so we could take a picture with the can. We had said Mission accomplished when we finally found the can. So we thought about dressing up like a military person. Since it was right before Halloween I said well let’s do it for Halloween. My boyfriend came up with the idea of being the old plastic army figurines. Since we both grew up playing with the little plastic toys when we were little, we thought it would be a classic idea. We weren’t sure how it was going to turn out but we attempted to make our own costumes. We used our own boots, pants, shirts, jackets. We had to purchase the toy guns, helmet, glasses and paint. We hung everything in our garage and spray painted EVERYTHING army green!!! 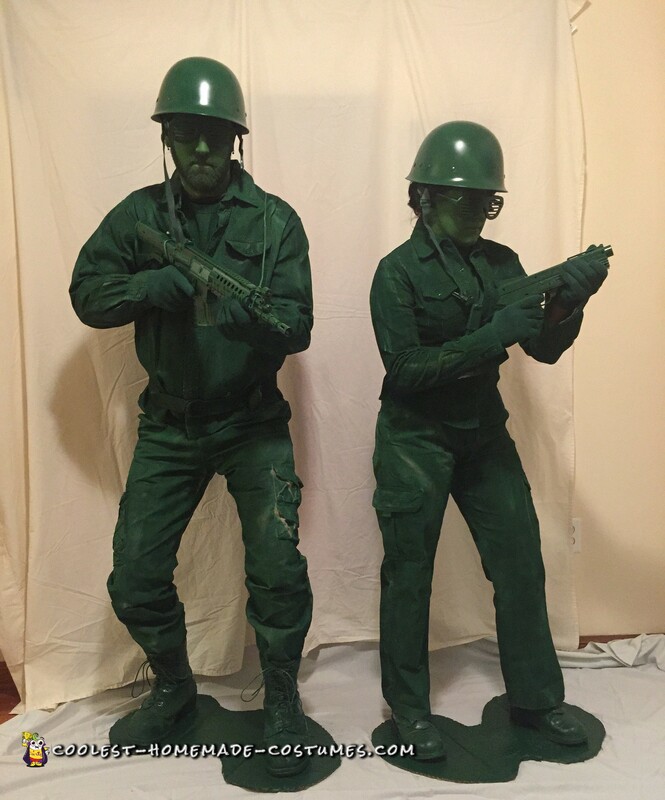 In our Plastic Army Man Costumes we felt like movie stars walking in to the costume party. People were impressed and amazed. Everyone kept asking for pictures. We posted it to Facebook and received so much feedback and amazing responses within the first half hour of posting it. We really enjoyed bringing back something from the past. The toys today are just so much more advanced than what we had. We can remeber how much fun we had playing with these little plastic army men for hours. We can also remember how bad they hurt when you stepped on one. What was even worse is if your dad stepped on one because then you were in some real trouble. It was great to see people really enjoying our Plastic Army Man Costumes and making them think about those toys in the past.